If you are looking for a football goal post that you can use in your backyard or out in a field, there are many goal posts that you can buy online at really affordable prices. If you or your child enjoy football, a goal post is essential. It is not enough to have a football, you also need a goal post, a tee and if possible markers, to make the game of football in the backyard more fun and enjoyable. Fortunately, there is a wide range of goal posts that you can order online. When selecting your product, you should focus on size and durability. You do not want it to be too small or too low. Furthermore, you should make sure that you are getting a product that is durable as it will have sustain rough handling as players hit it often with the ball. The first football goal post that we recommend is made by Franklin Sports (for ages 6 and above). What we like about it is that it come with field markers, a small football, a hand pump and even kicking tees. It is easy to put together, adjustable (two heights) and very durable according to user reviews and uses a water fill base which makes it very stable. The post size is quite large (6 x 4 feet) and the five field markers go from 10 yards to 50 yards which is ideal for the backyard. You can use it with a bigger ball especially as children grow up. It can actually be used by adults as well. Therefore, we highly recommend the Franklin Sports goal post to make playing football in the backyard more fun. What we like as well is the unbeatable price at below $40 and quickly delivered to your home. We also like the Mylec set. What we like about it is that it is slightly larger than the Franklin Sports one (5 x 5.5 feet) and it is very good quality. Mylec has a good reputation for making sturdy products. It also has a water fill base, and it comes with a football and a tee. Do not forget to also get a larger football as these sets usually come with smaller ball. And get a uniform, there are uniforms that you can also order online for really decent prices. 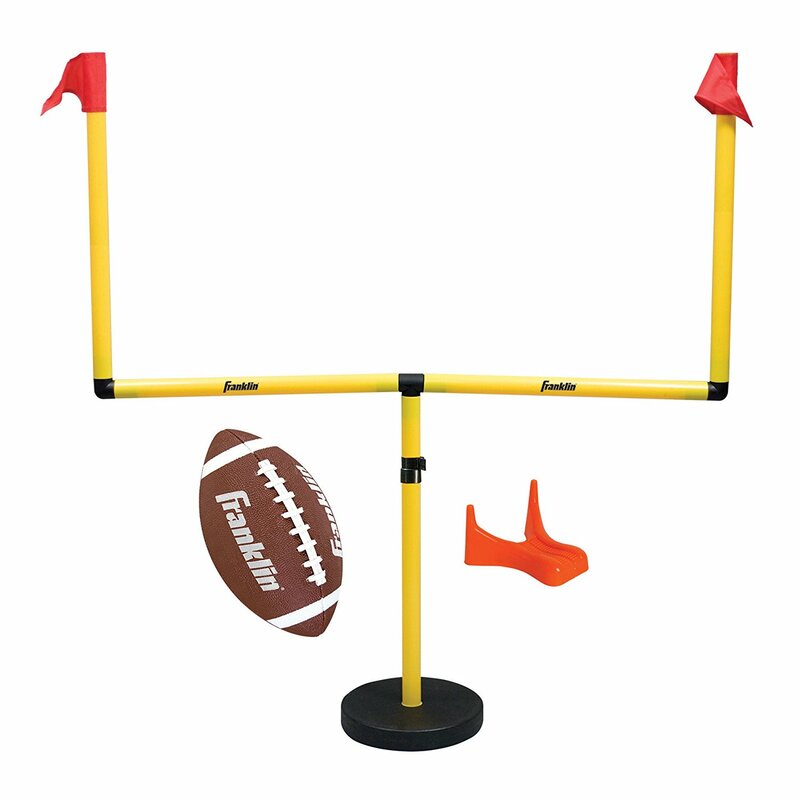 By the way, if you are looking for a gift for a child who likes football, a goal post set is a great idea!